Hi everyone, I'm back! I really didn't mean to stay away for so long and I could come up with several fairly decent excuses but the bottom lines are: 'life getting in the way of blogging' and 'perfectionism'. Anyway, I'm back and I would like to show you some of the thing I've been up to. You may have seen my posts about my two pairs of trousers in charcoal grey wool (blogged about here and here). They were made from the same piece of fabric. I bought four meters of it (standard discount at that store is 4 meters of thin wool or demin at 10 euros). The two pairs of trousers used up somewhere between 2 and 2,5 meters. So I made a jacket. I made my own pattern. 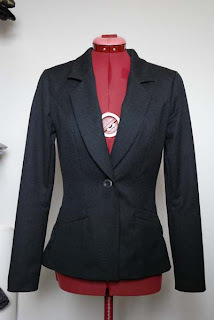 It's from my 'normal, contemporary' jacket block (I'll explain in a later post, I don't have pictures of the other one now) but this time, I added shoulder pads. I think for the first time. They are rather small pads, so they don't really stand out, but to me, the shoulder really does look more angular and a bit boyish (in a good way). only be a skirt (or a vest, but I never got those to look nice on me). Usually my leftover bits of fabric are a bit longer and a bit narrower and have to become staight skirts, so this one was definately going to be a wide skirt. 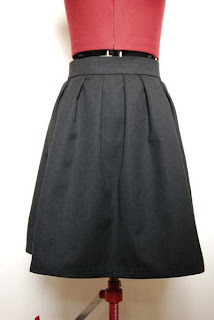 So it became a pleated skirt. However, working with M on her latest collection (and maybe reading Dress a day for, I don't know, ever) means that by now, I've been well and truly bitten by the pocket-bug. 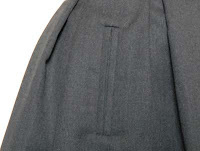 This skirt just had to have pockets. If I had had more fabric, I would have made scoop pockets but all I had left were some long, narrow strips. So I made bound pockets. Love the color and I think your pockets are amazing. Welcome back.